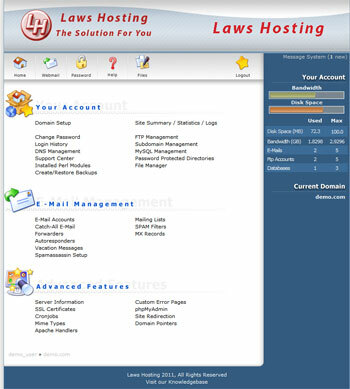 Laws Web Hosting is the leader of DirectAdmin uk web hosting and VPS hosting. We are now an official partner with JBMC Software (DirectAdmin), so we can provide licences with most of our VPS hosting packages, if you wish to have DirectAdmin, it runs on CentOS 5 and above, and, Debian 7 and above. All of our shared uk web hosting plans come with DirectAdmin uk web hosting panel, the web hosting industry's leading control panel. DirectAdmin's automated point-and-click platform replaces tedious tasks with web interfaces. Our DirectAdmin uk web hosting has multiple levels of administration, including database management, email accounts, and more. DirectAdmin uk web hosting various levels provide users from the email account user to the server administrator with flexibility, security, and ease of use. Laws Web Hosting is a low cost DirectAdmin hosting service that provides high quality solutions and everything you need to create an attractive and competitive website. Through the powerful and flexible DirectAdmin hosting solutions, Laws Hosting commits to providing DirectAdmin uk web hosting services at the lowest possible price without sacrificing the performance and quality. Stability. DirectAdmin hosting avoids downtime by automatically recovering from crashes. Hardware: Highly recommend a processor of at least 500mhz even though DirectAdmin will run on slower systems. A minimum 1 Gigabyte of memory is required (2+ Gig is preferred), with at least 2 gig of swap memory. A hard drive with at least 2 gigabytes of free space (after the Linux install) is also required. If you are expecting high traffic levels then you will need more memory, processor power, and hard drive space than we recommend here. Software: Please ensure SSH is installed and working.Please ensure named (Name Daemon) is selected during the Redhat install. gcc and g++ are required to compile apache and php. The system kernel and filesystem must support quotas. The kernel should support IPv6. 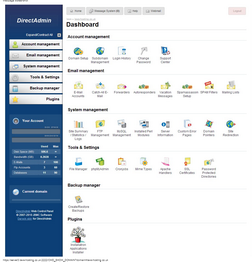 Don't just take our word for it - visit DirectAdmin's website to try out a DirectAdmin Demo of this amazing control panel! We also have indepth tutorials for users, you can see them by visiting our Tutorials page.